To help people celebrate the beginning of a New Year, we’ve got a special steak and lobster menu for you all through January – and available during both lunch and dinner services. More about this special menu in a moment. First, I thought I’d share a few tips on how to buy and store fresh lobster. How do you buy the best fresh lobster? Here are a couple of pointers that will help you buy the best fresh lobster here on the Orihuela Costa. Ask your friends, family and friendly local restauranteurs where they buy their lobsters. It’s not a dish that you’ll eat every day (see our article ‘Why is lobster so damned expensive?’ to see one reason why), but as a treat now and then it’s a perfect dish for a special occasion or a romantic meal. 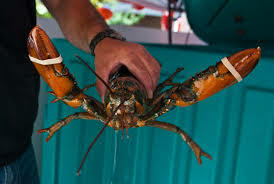 With luck, the recommendations will provide you with big clues as to where to visit for a lobster to cook at home. If this happens, you’ve got yourself a nice, juicy, fresh lobster. A bonus tip here: if you are buying more than one lobster and plan to store them together, never remove the tape that binds their pincers. Lobsters are cannibals. Release those pincers, and your lobsters will soon eat each other. Place the lobster in a tank of saltwater – a lobster will remain ‘fresh’ for between three and five days when stored this way. But remember, if you buy and cook on the same day, you’ll have a much better foodie experience. Put in the freezer for an hour before cooking. Use a knife to kill the lobster immediately before placing in the pot – plunge it into the area behind the lobster’s eyes. It will be dead, though its nervous system will still cause its legs to move for a short while. Not sure how to cook lobster? Yes, you did read that right. €18.95 for a three-course lobster, steak or chicken lunch or dinner. What are you waiting for? Call Christopher’s on +34 600 01 28 24 to reserve your table today and make your January a special occasion.